Got a question for us? Ask a question. If you have a question you would like answered here, please get in touch with us. Cremation is a part of a funeral service where the coffin is placed in a cremator and reduced to ashes. The ashes are placed in an urn to be scattered or interred at a later time. The cost of a funeral is composed of the disbursements paid by a funeral director on the family's behalf as well as the direct costs involved. The total cost of the disbursements may be larger if for example, a soloist or musician is required to play or multiple media announcements are made. The direct costs involved will depend on the wishes of the family as to where the funeral service is held and what type of casket or urn is required. What happens if someone dies abroad? In a situation where a death occurs abroad, arrangements can be made to repatriate the deceased home. Similarly, if a foreign national dies in Ireland, a funeral director can make the necessary arrangements. What is a post-mortem examination / autopsy? A post-mortem examination is a surgical procedure involving the dissection & examination of body tissues to determine the cause of death or the nature of disease. Embalming is the preservation of the deceased using special techniques and fluids which allow for the deceased to be viewed without interference from unpleasant odour and changes which occur after death. In relation to funerals, disbursements are payments made by a funeral director on behalf of the family. This service is provided as these charges may need to be settled immediately. They may include purchase & preparation of graves; media announcements; and gratuities. Funerals are a customary way for people to celebrate the life of and express grief at the loss of a friend or family member. Funerals can help people come to terms with bereavement and allow the community to express their condolences. What is the purpose of a funeral home? A family home may not be equipped to deal with the attendance at a removal. Funeral homes are built to facilitate comfortable removals and can remove the strain of having a removal from a family home. What form does a funeral take? Funerals have some attributes in common but each individual funeral is different. The familiar Irish funeral takes the form of a removal service from a funeral home, nursing home, hospital or hospice to a church. The following morning the funeral proceeds to a cemetery after a service in the church. 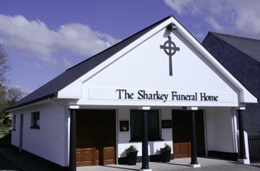 Secular Irish funerals can opt to proceed from a funeral home to the cemetery. Similarly for Islam and Judaism there are specific rites and rituals, though local custom may vary in the interpretation of the ritual.